Our relationship with you is our most important asset. We understand that you have entrusted us with your private information, and we do everything that we can to maintain that trust. MBE Wealth (also referred to as "we", "our" and "us”) protects the security and confidentiality of the personal information we have and implements controls to ensure that such information is used for proper business purposes in connection with the management or servicing of our relationship with you. MBE Wealth does not sell your non-public personal information to anyone. Nor do we provide such information to others except for discrete and reasonable business purposes in connection with the servicing and management of our relationship with you, as discussed below. MBE Wealth does not disclose, and does not intend to disclose, personal information with non-affiliated third parties to offer you services. Certain laws may give us the right to share your personal information with financial institutions where you are a customer and where MBE Wealth or the client has a formal agreement with the financial institution. We will only share information for purposes of servicing your accounts, not for marketing purposes. 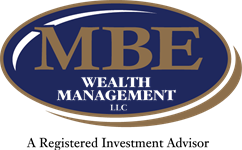 MBE Wealth does not disclose and does not intend to disclose, non- public personal information to non-affiliated third parties with respect to persons who are no longer our Clients.